I hope you don’t mind the fact that it’s April and I’m just now talking about what I was cooking on Christmas day. Wendi time works on its own schedule. I feel as though I spent Christmas day with Rose Levy Beranbaum. Oh my, what a wonderful thing that would be. Not only did we have her apple filled dutch baby for Christmas breakfast, we had her butter dipped dinner rolls at dinner. Christmas was filled with all kinds of Bread Bible Studies. And it was a complete success. BAH Note: This is not a quick recipe. But if you plan accordingly, the end result will be worth the wait. I never imagined I would say that about a dinner roll that came out of my oven. But I did and I stand by it. I may sound like a broken record here but again, I don’t know if my flour was bleached or unbleached and my results were spectacular. If you have the space to store both bleached and unbleached all purpose flour, please don’t tell me because I will develop a raging case of storage envy. Combine all the ingredients in the work bowl of a stand mixer and whisk by hand for 2 minutes until very smooth and the consistency of a thick batter. Scrape down the sides of the bowl and cover with plastic wrap. Once you have made the starter, begin working on the rest of the dough. In a separate bowl, whisk together the flour, milk powder, and yeast. Sprinkle this on top of the starter, cover the bowl tightly with plastic wrap, and allow to sit for 1 to 4 hours at room temperature during which time the sponge may bubble through the flour in places. Add the butter to your mixture and mix on low speed for 1 minute with the dough hook until the flour is moist enough to form a rough dough. Scrape down any bits on the side of the bowl, cover with plastic wrap, and rest the dough for 20 minutes. Sprinkle the salt onto the dough and knead on medium speed for 7 to 10 minutes until it comes away from the sides of the bowl, is smooth and elastic, and sticks to your fingers. Use an oiled spatula and scrape down any bits on the side of the bowl. Quickly turn the dough out of the mixing bowl and coat the bowl with cooking spray. Return the dough to the bowl, gently push it down, and spray the surface with cooking spray. Cover the bowl with plastic wrap and allow to rise for 1 1 /2 to 2 hours or until doubled in size. Use an oiled spatula or bench scraper to turn the dough out onto a floured counter. Gently press it into a rectangle. Fold the top third of the dough down and the bottom third of the dough up as though you were folding a letter. Rotate the dough 90 degrees and repeat. Return the dough to the bowl and spray the surface lightly again. Cover the bowl with plastic wrap and allow to rise for 1 to 2 hours or until the dough has doubled in size. To form the rolls, gently roll the dough into a long log and cut into 18 pieces, each piece approximately 1 ounce or 2 tablespoons. Roll each piece into a ball between your palms and place on a baking sheet lined with parchment paper. Brush the melted butter onto the rolls, cover loosely with plastic wrap that has been coated with cooking spray, and allow the rolls to rise for approximately 1 to 1 1/2 hours or until doubled. During this final rise, place an oven rack with a baking stone on it at the lowest level and place a sheet pan or cast iron skillet on the oven floor and heat the oven to 400 degrees. When ready to bake, remove the plastic wrap and set the sheet pan on the baking stone. Quickly add 1/2 cup of ice cubes into the pan on the oven floor. Bake for 15 minutes or until golden brown. Remove from the oven and brush with any remaining melted butter. 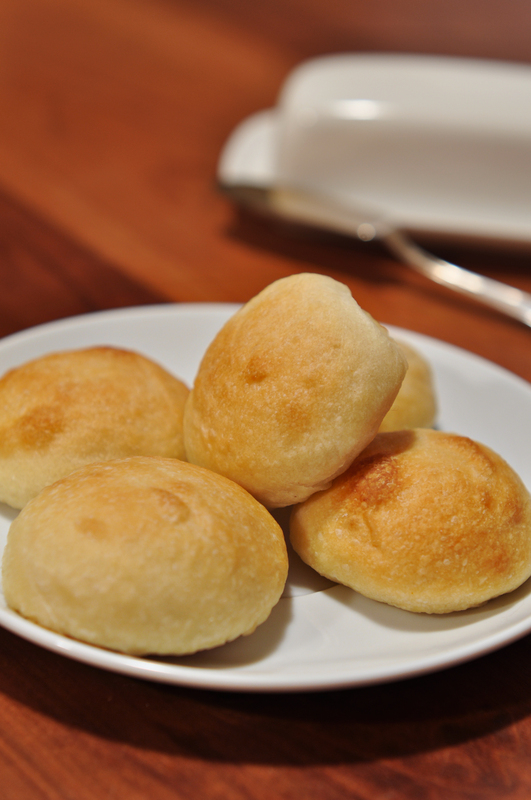 These rolls were born to be savored with butter. Those are some fine looking rolls. And maybe we can take your Christmas posts and use them for Easter dinner. Win-win! Jennifer, absofreakinglutely. Just think of the late nigh ham sammies you could snack on if you made a batch of these rolls for Easter. I think the Pioneer Woman has a recipe like this. Mmmmm. Butter. She sure does. I’ve made them and they are fabulous. And through the magic of store bought frozen rolls, they are much quicker to make. Howdy Mark, thanks for stopping by. There really is something wonky about simplicity not being quite so simple. Seriously, to look at those rolls, you would not think they took an entire day to go from raw ingredients to finished product. Silly, I-feel-like-I-should-know-this question: is a baking stone the same thing as or similar to a pizza stone? Ali, I won’t say there are no silly questions, because lord knows I ask a ton of them. But yours is not silly. Yes, a baking stone is pretty much the same a pizza stone. Pizza stones might be a little thinner but they function in the same way. Awww, shucks Jenna. I was really surprised that I didn’t manage to mess them up. Elizabeth, maybe I should have waited to post this until we get into the dog days of summer…then thinking about December would take our minds off the oppressive heat and humidity. I don’t think I’ve ever had a homemade dinner roll at a family event. Want to come to my family dinner? 🙂 These sound delicious with all that butter. Jen, there were no homemade rolls at any of the Sunday or holiday dinners of my youth. Maybe if there had been I wouldn’t be quite so yeast averse and clumsy now. These look great no matter what time of year. My copy of The Bread Bible is well worn, never steers me wrong. I know the Bread Bible is a solid resource. It’s just a challenge for me to commit to following through on setting aside the time to get from start to finish. I’m a bad Bread Bible Studies student…but I’m trying to improve. You said it best…how could something so simple not be so I’m trusting you that the result was worthy of the effort. They do look simply divine! Barbara, the ends did justify the means. And it gave my confidence a bit of a boost to have successfully produced dinner rolls. Anna, at this moment I can think of nothing happier than a warm roll slathered in butter. These rolls look absolutely beautiful!